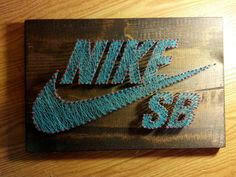 (From Brooklyn) This is my "Nike SB Swoosh" string art i have found on google images. This is for my technology homework were we had to find a piece of string art and send it to miss with a description, I like this artwork because it has very good features exactly like the real logo and this is my favourite brand! !